On Nikola Tesla's birthday in mid-July, the electrical term which his name has become is regenerated as a tall, meagre, eagle-headed man. Reporters hunt him out of his hotel cubicle for his yearly interview and for a day his long-standing fame flares again. 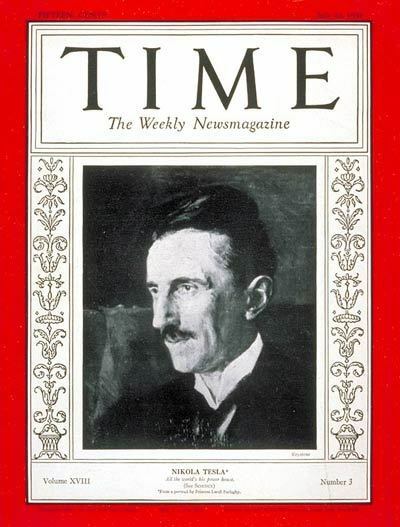 People who all their lives have lived by means of the devices he has invented and inspired, people who have forgotten there were an Alessandro Volta, an André Marie Ampère, a Georg Simon Ohm in, a Charles Augustin de Coulomb, a Luigi Galvani or a James Watt, are reminded that there still is a Nikola Tesla (pronounced Tcshlah) who long ago rave them the Tesla induction motor which made alternating current practical, and the Tesla transformer which steps up oscillating currents to high potentials (15,000,000 volts he avers, with 100,000,000 possible).